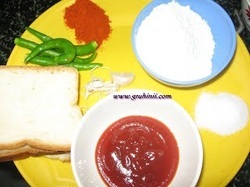 Marinate the chicken pieces with maida, bread pieces (dipped in water and squeezed) 1tsp chili powder and salt. 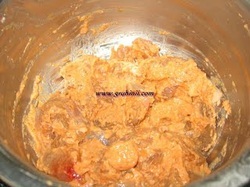 Leave the mixture for an hour. Deep fry these pieces in oil and keep aside. Heat oil in a pan, fry cumin seeds, chopped garlic then green chili (slit length wise). After frying for sometime add Onions and fry until they turn pink. Now add blanched and pureed tomatoes and cook until the gravy thickens. Then add all the sauces, sugar and salt to taste. 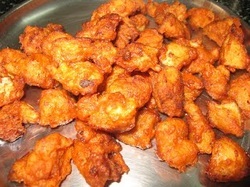 Now add the fried chicken pieces and mix well.. switch off the flame and take it into a serving bowl. Garnish with chilies and coriander leaves.